The names of the nine people who were killed in the crash of a military cargo plane in Georgia were released Thursday by the Puerto Rico National Guard. 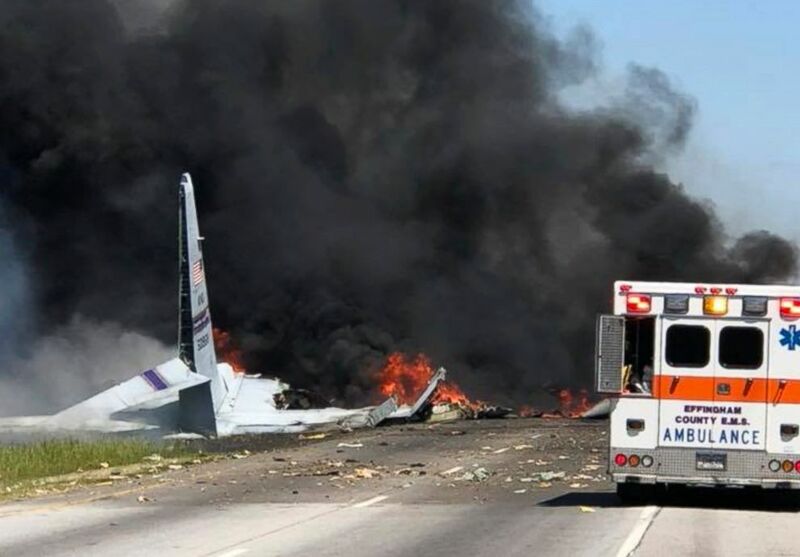 The crash took place shortly after the WC-130 plane took off from Savannah/Hilton Head International Airport on Wednesday morning. The plane was en route to a so-called "boneyard" in Arizona. The “boneyard” is the holding facility at the base for 4,400 old aircraft that are stored for spare parts or future use. All of the victims were members of the 156th Air Wing of Puerto Rico's Air National Guard. “Taking care of our fallen Airmen’s families and loved ones is our top priority,” said the adjutant general of Puerto Rico, Brig. Gen. Isabelo Rivera, in a statement released with the names of the victims. "We are fully supporting them and providing all the assistance and resources of the Puerto Rico National Guard during this difficult moment," he added. Flames and smoke rise from an Air National Guard C-130 cargo plane after it crashed near Savannah, Ga., May 2, 2018. An Air Force official told ABC News that five of the victims were traveling as crew members on the flight and the other four were traveling as passengers. The list of names released by the Puerto Rico National Guard noted that all nine had several years -- and for some, decades -- of experience in the service. Rosado had 18 years of service in the National Guard. He is survived by his wife and two sons. Serra had 23 years of service. He is survived by his wife, two sons and a daughter. Albondoz, a Puerto Rican native who had been living in Alabama before the crash, had 16 years of service. He is survived by his wife and daughter. Paravisini had 21 years of service in the National Guard. He is survived by two daughters and son. Audriffred had 16 years of service prior to the crash and is survived by his wife and two sons. Braña had 17 years of service in the National Guard. He is survived by his mother and daughter. Colón had 22 years of service before the crash. He is survived by his wife and two daughters. He had 31 years of service to his name and is survived by his wife, two step-daughters and son. Espada had three years of service and is survived by his grandmother.